This book came up on my Amazon recommendations list. Is it any good? I suppose a book more dedicated to the region I live in would be better suited. I really like Thayer's books, I have The Forager's Harvest as well as Nature's Garden and I think both are very good. If you intend to stay in the mid to southern parts of Minnesota they are really good. If you get norther, above the hardwood's line if you will, they are still good but not as applicable. He still imparts a good bit of information that can assist the forager beyond specific plants. I consider those two books great additions to my small forager's library. For Minnesota specific books you'd be very hard pressed to do any better than Trees of Minnesota by Stan Tekiela and The Wild Berries and Fruits field guide for Minnesota, Wisconsin, & Michigan, by Teresa Marrone, and finally, Lichens of the North Woods by Joe Waleski. Those ride around in my pack three seasons a year. I couldn't tell you how many times I've found them very beneficial. If nothing else get the Trees of Minnesota and Wild Berries & Fruits, they are worth their weight. 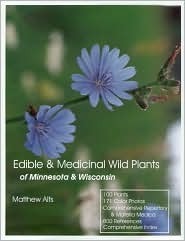 For general edible wild, Thayer's books are good but they do not cover a really wide spectrum of plants, what they do cover is as good as it gets and well worth the price in my opinion. I just got this book as payment for a carving so far it looks good though I haven't fully gotten into it yet. Top notch info as always AG. Thanks for the heads up! Without a doubt and excellent book. It's not a field guide though. It's more of a textbook that you read to learn about plants you might be looking for. It's not about finding a plant you can't identify in the wilderness, using features to look it up. That's more the realm of the Peterson's Guide. I've got both books. I read the Thayer books at home and try to memorize key ID characteristics and preparations. I usually carry the Peterson's Guide in the field for reference when I can't recall a detail. The Peterson's is lighter and covers more species, so it's nice to have for those "Ooh, what's that?" moments. If you really want to get into foraging, not just identifying, then the Thayer books are for you. If IDing a large number of plants is more important, go for the Peterson's. Or you can do it like I did and buy both! P.S. If you do get the Thayer book, consider getting the set from his website. I think there's a slight savings when you get both. It was given to me as a gift a while ago, so I am unsure of the cost now. Just offering another choice for you that is "region specific". I just got foragers harvest sunday. started reading it today. very highly recommended. I would have gotten natures garden too but I went to Barnes and Noble and only found the one. How bad is the misinformation in the peterson's guide. I have read many places that there is wrong info in that book but it has never been specified exactly. Wonder if that's true at all. Thayer's works are fantastic. He is big on personal experience, rather than taking for gospel what others before him have said, which is reassuring to me. Here is a thread I started on his books and others. I have both of Thayer's books and love them. The by John Kallas is also top notch.